Explaining the differences between qualified and unqualified plans, and more. A qualified retirement plan is a funded plan for which organizational assets irrevocably have been set aside, outside the reach of general creditors of the company. These funds pay for benefits as they become due. Companies obtain tax deductions for contributions made to qualified plans at the time the contributions are made. Taxation to participants occurs when amounts are paid to them from the plan. Thus, such plans are tax-beneficial. For that reason, Congress, through the Internal Revenue Code (IRC), has limited their benefits. In the U.S., qualified retirement plans are governed by the Employee Retirement Income Security Act of 1974 (ERISA) and tax rules. Qualified plans include common retirement vehicles such as 401(k) plans and defined benefit pension plans (“DB plans”). To be qualified, plans must meet various rules regarding such aspects as broad-based participation, vesting, funding and information to participants. Over the past 15 years, many companies have either frozen or eliminated their DB plans and moved to a defined contribution (“DC”) approach. DC plans are often less costly and less volatile for employers and offer portability for employees. 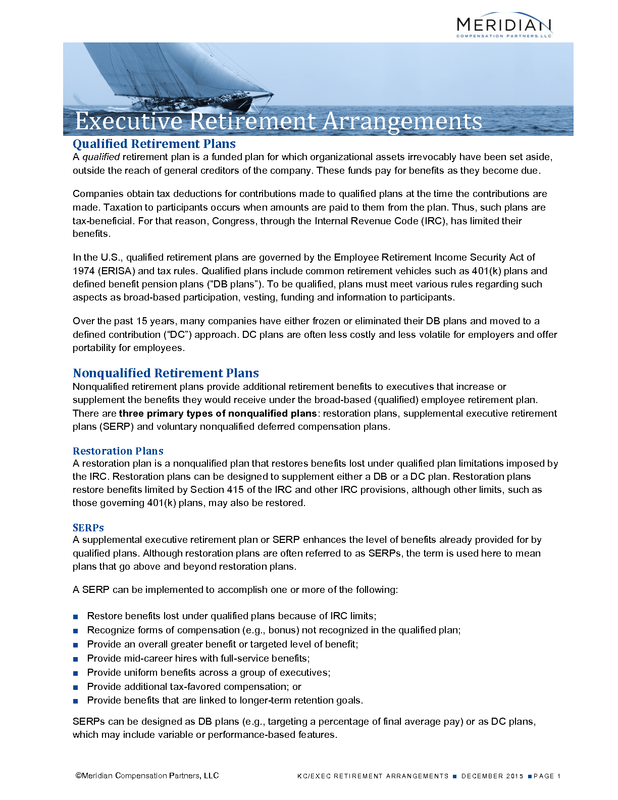 Nonqualified retirement plans provide additional retirement benefits to executives that increase or supplement the benefits they would receive under the broad-based (qualified) employee retirement plan. There are three primary types of nonqualified plans: restoration plans, supplemental executive retirement plans (SERP) and voluntary nonqualified deferred compensation plans. A restoration plan is a nonqualified plan that restores benefits lost under qualified plan limitations imposed by the IRC. Restoration plans can be designed to supplement either a DB or a DC plan. Restoration plans restore benefits limited by Section 415 of the IRC and other IRC provisions, although other limits, such as those governing 401(k) plans, may also be restored. A supplemental executive retirement plan or SERP enhances the level of benefits already provided for by qualified plans. Although restoration plans are often referred to as SERPs, the term is used here to mean plans that go above and beyond restoration plans. Provide benefits that are linked to longer-term retention goals. SERPs can be designed as DB plans (e.g., targeting a percentage of final average pay) or as DC plans, which may include variable or performance-based features. Eligibility for SERPs is usually limited to officers or senior management, but can be narrow (e.g., one executive) or broad (e.g., a selective group of executives), depending on the purpose of the plan. For example, if the plan is implemented as a retention vehicle for the CEO, the CEO may be the only participant in the SERP. Or, if the plan is designed to recognize bonuses as pensionable earnings, it may include highly compensated employees eligible for a bonus. Following are proxy disclosure and design considerations regarding SERPs. Defined Contribution Plans: Companies must disclose the annual contribution or allocation for each named executive in the “All Other Compensation” column of the Summary Compensation Table. The disclosure must include all amounts contributed during the reporting year to all DC plans, including qualified and nonqualified arrangements whether vested or not. However, nowhere in the table or elsewhere in the proxy is the company required to disclose the earnings attributable to such arrangements (unless the earnings are above market) or the total obligation accrued to date. The proxy rules require Summary Compensation Table disclosure of the aggregate increase in actuarial value to the executive officer of DB and actuarial plans (including supplemental plans) accrued during the year. Companies are generally required to provide a separate Pension Plan Table for plans that determine benefits primarily based on final compensation and years of service. The table should show estimated benefits at retirement for different covered compensation levels, specified compensation and years of service classifications, and benefits attributable to all qualified and nonqualified pension plans. The company must also disclose the definition of covered compensation, the estimated years of credited service for each named executive, the basis upon which the benefits are computed and whether any offsets apply. Deciding who is eligible to participate in the plan. Determining the degree of benefit and analyzing company cost associated with providing the benefit. Providing appropriate investment choices (for DC plans). Choosing the vesting schedule. SERPs can have lengthy vesting requirements, particularly where the benefit is somewhat rich and the company wishes to reinforce retention of executive talent. Special features. SERPs can include special features to reflect specific situations. For example, a SERP may have a subsidized early retirement reduction factor that is more favorable than the broad-based plan. Deferred compensation plans are a means of providing retirement income to executives who are limited in what they can receive from or contribute to broad-based employee plans. Also, increasingly, deferred compensation is used as a means for offering executives financial planning flexibility. These plans enable executives to save on a pretax basis (subject to FICA tax at deferral on account-based benefits). In nearly all cases, the deferred compensation is credited with earnings until paid out. Some plans provide participants’ earnings based on an interest-based index (prime rate, government bond rate, etc. ), or a mutual fund index that the executive may select. The method of crediting earnings to the deferral is completely at the employer’s discretion, although if the method is not attractive, the plan could have little value to the executive participant. Because such plans are not qualified, they do not provide a tax deduction to the employer until the executive recognizes taxable income. Despite this, nonqualified deferred compensation plans typically present only minor cost liabilities to the company. However, if the crediting rate used to determine earnings on participant deferral accounts is higher than the after-tax investment return the employer can make on the funds retained from the deferral, then the nonqualified deferred compensation plan will have an incremental economic cost to the employer. For example, if the plan credits 10% interest on the deferral accounts, but the employer only earns 6% (after tax) on the cash retained as a result of the deferrals, the employer will incur a cost. The employee’s tax objective of deferring taxation until distributions are made is defeated if the doctrine of constructive receipt or economic benefit applies to the deferred compensation arrangement. In such case, the employee is taxed currently on amounts he constructively receives or for which he has the economic benefit. Constructive Receipt—Income, although not actually reduced to a taxpayer’s possession, is constructively received by the taxpayer in the taxable year during which it is credited to the taxpayer’s account, set apart for the taxpayer, or otherwise made available so that the taxpayer may draw upon it at any time, or could have drawn upon it during the taxable year if notice of intention to withdraw had been given. However, income is not constructively received if the taxpayer’s control of its receipt is subject to substantial limitations or restrictions. Economic Benefit—A taxpayer may be taxed on the receipt of property as well as cash if such property is intended as compensation for services. Eligibility—Generally, unfunded deferred compensation plans must meet the Department of Labor requirements of a “top hat” plan (a plan restricted to a select group of highly compensated employees so that full ERISA requirements of participation, funding, vesting, etc. do not apply to the plan). It is important to keep in mind that the larger the top hat group, the greater the exposure to failing to meet the top hat rules, which can lead to risk of penalties, accelerated funding and possible taxation of vested (funded) benefits. Deferral Election Timing (Constructive Receipt)—Under the IRS safe harbor, in order to avoid taxation under what is known as constructive receipt, the deferred election must occur prior to the time the pay is earned or “determinable.” This indicates that the election to defer should be made before the start of the calendar year during which the pay will be earned. Section 409A rules have a direct impact on election timing. Form of payment (lump sum or annual installments). Proxy Disclosure—Under current proxy disclosure rules, if a plan provides an above-market value of interest, the value must be disclosed in the Summary Compensation Table in the Other Compensation column. In addition, a specific Nonqualified Deferred Compensation Table that annually reconciles contributions, withdrawals and remaining balances must be provided. Nonqualified retirement and capital accumulation arrangements are generally designed purposely to be exempt from most ERISA protections. In addition, should they be funded in such a way as to create a secure value for participants, they would forfeit the deferral of taxation they are generally designed to achieve. Thus, they remain unsecured general asset promises of the employer. Rabbi Trust—Employer is the grantor; contributions may be irrevocable but trust assets are available to creditors in the event of bankruptcy. Springing Rabbi Trust—Rabbi trust with token funding that is fully funded upon a change in control. Corporate-Owned Life Insurance—Employer-purchased individual life insurance with cash value earmarked for the nonqualified benefit. Accounting for nonqualified restoration plan, SERP plan and deferral plan benefits is the same as accounting for the related qualified plans—with one important exception. With a qualified plan, assets placed in a trust for the benefit of participants are counted as “plan assets” and reduce the amount of obligation reflected on the employer’s balance sheet. With a nonqualified plan, assets segregated and expected to be used for the benefit of participants are in most cases still treated as general assets of the employer and may not be counted as plan assets. In other words, the gross nonqualified benefit obligation is reported in the financial accounts. FICA tax is paid as benefits are earned. However, in the case of DB SERPs and DB restoration plans, when the exact value of the benefit is not immediately known, FICA taxation may be postponed until retirement. Note, however, that retirement may actually precede benefit payment.